On Costa Rica’s central Pacific coast is one of the country’s most visited tourist destinations. And it’s popular with expats too. 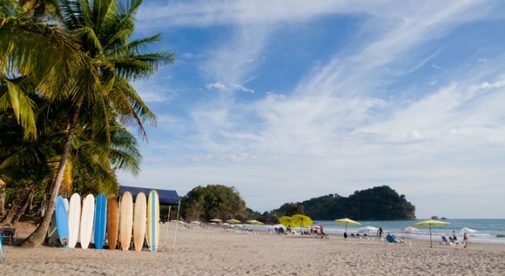 It’s called Manuel Antonio, and its white-sand beaches, wildlife-filled jungle, and dramatic scenery of mountains looming over the blue ocean is the stuff of postcards. When the weather is warm year-round—mid 80s F with a sea breeze—you tend to have a pretty limited wardrobe. You’ll have to get used to opening your closet to a shelf full of t-shirts and tank-tops, shorts and swimsuits, sandals and flip-flops. Even if you’re going out for a nice meal or dinner party, that’s what you’ll wear. At most you might try a tropical print button-up shirt, but it’s really a casual place. Unfortunately, you’ll have to leave your coats, jackets, dress shoes, and long pants at home. You can’t really spend a bunch of money to follow fashion trends either, as comfort is key in the tropics. There aren’t even any fancy clothing stores to shop in! If you love being bored, then you’ll have a hard time in Manuel Antonio. There are myriad activities available. You can hike in a national park, watch monkeys cavorting in the trees, take pictures of scarlet macaws, take a swim in clear Pacific waters (always warm), relax on secluded white-sand beaches, enjoy a cold beer with your toes in the sand, hang out with friends, host BBQs, go shopping in an open-air farmers’ market, catch mahi mahi for dinner just offshore, enjoy a sunset view at happy hour, take a surf lesson…and that’s just a start. You’ll fill your day and then some. Many retirees in town say they’re busier than ever in retirement. Some advice: keep a calendar to keep track of your schedule. Expats and locals in Manuel Antonio are a friendly bunch. It’s a small town…where everybody knows everybody. The expat community will welcome you with open arms and soon you’ll have an active social life with folks from the U.S., Canada, Europe, and beyond. You can’t help but meet interesting people from around the world. Most likely if you see somebody you know at the local café or market they’ll want to stop and chat, taking time out of your day—it’s like that in a small town. You might be asked to help out too, if a neighbor is in a tight spot. And they’ll do the same for you. And don’t expect to spend much time keeping yourself company. You’ll be dragged kicking and screaming into the vibrant local culture, and be plagued with invites to birthday parties, fiestas, and other celebrations with your Costa Rican friends. If you like to go out to eat, you’re in a tough spot in Manuel Antonio. There are close to 200 restaurants in town—and that’s just what’s listed in TripAdvisor. So if you’re heading out for a night on the town, you’ll have a hard time deciding where to go. Sushi, authentic Italian, sports bar fare, seafood, steak houses, local places with Costa Rican cuisine, and more. There’s even fine dining for a special occasion. And most places are reasonably priced, so you’ll probably find yourself eating out more often. It’s going to be hard work trying out all these places, so bring your appetite. Once you’ve visited the beaches in Manuel Antonio, no other beaches will measure up. Picture white sands and turquoise water, with a backdrop of swaying palm trees, rainforest, and limestone cliffs covered in jungle trees…and sparse development to ruin the view. In some spots you can snorkel right off the beach. Or you could rig up a hammock between two trees and read a book (or doze off) in the shade, lulled to sleep by the waves lapping up the shore. Beaches back home, full of condo towers and throngs of people, just won’t do it for you anymore.